Cute, winged insect creatures carried components of the nativity scene one by one through the snowy forest. Up went an angel. Up went a donkey. Up went a shepherd. The swarm went through the hilly forest, over to a snow-covered front yard. The caller to the nationally-syndicated radio show described what he was having the Pokemon vibrava in his smartphone do. “Nativity scenes are beautiful!” the famous disc jockey said. As he spoke, one-by-one the creatures carried the figures to their far-off destination. They flew around trees, down into valleys, up hills. Moonlight spectacularly glinted off of them. Delilah knew that enough trapinch candies that the little ant-like creature will evolve into vibrava in Pokemon Go. Maybe she, herself, played the virtual-reality game on her smartphone. Apparently, in this dream world, having a video-game creature do a chore for you is nothing unusual. 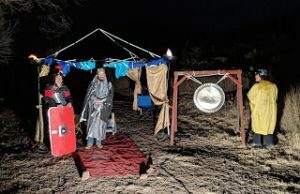 It was a dream inspired by a mix of hokey Netflix Christmas movies and the annual Living Nativity Scene pageant put on in a wooded area by a group of churches here in Alpine, TX. When I mentioned to someone I was going to start a blog about dream journaling, they assumed the blog was just going to be about dreams I had. That’s the way I still feel. I don’t think anybody really wants to hear about my dreams three times a week. They want to have and remember their own. This blog is about solving problems with sleep and general sleep education. It’s helpful to think of all of that as “sleep skills and tools.” Dream journaling is a big part of it. Sleep is seen by many as non-productive time. After all, you’re only laying there — right? A lot is going on when you sleep. Maintenance, mainly. Q: How does anything run if you don’t maintain it? When you keep a dream journal, you’re seeing that you get as much as you can out of sleep. It’s a form of meditation. You see where you’re at with your interior thoughts. It also promotes sleep which is important for health and helps someone avoid many other problems. This Christmas I’m feeling I didn’t do enough to celebrate the season and I’m wishing I did more. I know this because I keep a dream journal. I can now listen to my subconscious and do something to rectify the situation. As a Christian, I believe His birth was one of the greatest gifts ever and I need to make a big deal about it because it’s important to me. Your subconscious is going to have its own idea about what you should be doing. You can find out by keeping a dream journal. Pokemon Go, Vibrava and Trapinch are trademarks of Nintendo, Inc.